Great deal on a highly rated Cedar swingset from Walmart! 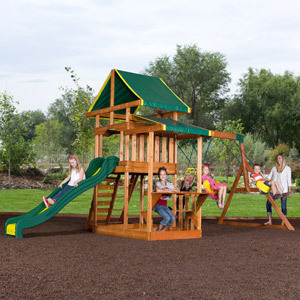 Backyard Discovery Pathfinder Ii Cedar Wooden Swing Set – Was $499; Now Only $399 at Walmart.com! It has an overall really great 4.1 star rating and is currently priced at $100 off! This is a Walmart ROLLBACK and Ships via Freight. FREE Store Pickup as soon as 04/18/2014. The Pathfinder II Wooden Swing Set is back by popular demand! Ideal for social, active children, this cedar swing set features an upper play deck with a colorful, eye-catching canopy. To access the deck, kids can use the standard stepladder or the more challenging rock wall ladder. The 8′ speedy slide of this backyard swing set safely zips kids back down to the yard. Beneath the fort, there’s room for a sand box, plus a snack table that has its own canopy cover. Two belt swings and an acrobat bar hang from the swing beam for hours of airborne swinging fun. The Pathfinder II Cedar Swing Set offers all the fantastic features of the original Pathfinder, and your kids will absolutely love it! $399 is less than I’ve seen used sets like this go for on Craigslist!